Some tourist travel with an organised tour, some share the cost of a hired jeep, and few use public transport. It is true that there are no western style bus terminals (see photo on the left), there are no signs in English, and the time tables are somewhat flexible. Once you adapt to the Mongolian style of public transport you will find it rewarding. The people are friendly, and it is the cheapest way to travel. 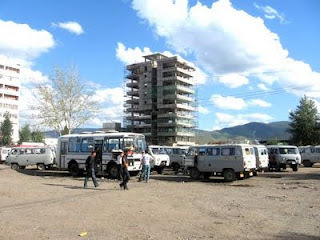 Buses go from Ulaanbaatar to all Aimag (province) centers. From the Aimag center you wait with others for a van to fill up going to a Sum (district) center. If you attempt to go to a tourist attraction that is not on the public transport routs, you will find jeeps or vans ready to be hired to take you to a specific location. Any private car can act as a taxi. zoom in (click +) and change to "Sat" (Satellite mode). To identify the proper van have the destination name in Cyrillic letters with you. The vans display a board with the destination on the windshield. Public transportation vehicles include buses, minibuses, vans and cars. Buses leave at a set time, minibuses and vans leave when they are full. Zoom in to the maximum on the map to see the exact locations. Dragon (Songino Khairkhan)- buses going north and west. Teevriin Tovchoo (near Idre's guest house)- vans going north. For long distance buses you have to purchase the ticket the night before departure. The fare to Olgii is 63,000 Togrog which is 1,700 km to the west. For comparison - locals pay at least 400 Tugrug per Km to hire a jeep and driver, not including petrol cost. To hire a jeep to Olgii would cost 680,000 Tugrug. This is more than 10 times the cost of a bus ticket. It takes a 18 hours to get to the Gobi town Dalanzadgad, and 34 hours to get to Khoved in the west. The roads to most location are unpaved bumpy dirt roads. River crossing on some locations are on a wooden barges. The vehicles go non stop, with short breaks on the way. Vehicles are packed full, with boxes of merchandise in between. There are many routs, here is a sample of a few. To go to Khovsgol lake take the bus to Moron. going to Khatgal, the village on the southern shore of Khovsgol lake. Tickets purchase: the evening before departure. From Dalanzadgad hire a jeep to take you to the popular destinations. Try and go with partners on the bus to share the cost of the jeep. In Olgii hire a jeep to the mountains (i.e. to Tavan Bogd). How long to the trips take? The range of times and typical duration would be good. Although many services are daily I imagine that they are often cancelled if there are not enough passengers? I have added travel durations. Buses are not canceled, vans and cars leave only when full. It rarely happens that no car leaves, passengers will wait for the next day. In cases of severe weather trips might be postponed. Is there a bus connection from Ulaanbaatar to Tosontsengel, Zavkhan? To get to Tosontsengel in Zavkhan, take the bus from the Dragon bus station in UB, going to Uliastai. Uliastai is Zavkhan's capital and located 1100km away from Ulaanbaatar. At the Uliastai market look for a van going to Tosontsengel which is 180km away on a good road. Is there a bus connection from Erdenet, Orkhon to Moron, Khövsgöl? And from Moron to Bayanzurkh, Khövsgöl? The public transport in Mongolia is a star system. All transportation goes from the center of the country UB to Aimag/province centers and from province centers to sum/district centers. In the small towns look for vans near the market. Question: is it easy to transport your bicycle on the bus ?? Merchants load crates on the bus. So try and pack your bicycle in a box, similar to the way you would for a flight. Take off the wheels, dismantle the paddles, turn the handle bar sideways. This will enable you to make the package as small as possible, and minimum damage to your bikes. Hello, I was wondering: is it possible to take a bus from Khovsgol area to Altai? You should return to UB, and take the bus from UB. Mongolia, thanks so much your updated detail on this blog. I'll visit UB this May and would like to ask you about transport. I'll take a bus from UB to UU. 1. Which bus station I should go? 2. Where I can buy the bus ticket? The location of the bus station in UB going to Ulan-Ude in Russia changed. It is now near the train station. To buy the tickets go inside the train station booking hall, go upstairs, go to the small window to the left of Tenger Travel, which is opposite the train ticket booking windows. Bus ticket cost is about 45,000 togrog. Bus leaves at 7:30am from the train station. Thanks your info on the bus location! Hi Mongolia, my friends and I will be in Mongolia during early July, we intend to travel to Khovsgol Lake. Is the travel time mentioned in the blog still valid as is? Yes about 20h to Hovsgol. I'm Ena from Estonia. I'm trying to find out prices and possibilities for a group of people (maybe 8-10 people) to hire a van with the driver who also knows the ways to make a trip. - 2nd day: Khongoriin els, singing sands, stay the night at ger camp. - 3rd day drive to Bayanhongor. Can you help me with the answers? Or do you know anyone who can? What would be the price for hiring a van for such a trip? Is it calculated per day? If there are 8-10 people, is 1 van enough? Can the van drive from the Gobi directly to Bayanhongor? Or does it need to go to UB road first? I found a person to answer me, but then he never again wrote me back, so I don't know where to find help. I would appreciate a lot your help! To arrange vans in advance you will need to contact a tour operator. Unfortunately there are no tour operators in Dalanzadgad. You will have to contact a tour operator in Ulaanbaatar. To drive comfortable vans take 4-6 people. The cost would be $50-$100 per person. Yes you can drive directly to Bayankhongor without having to go through Ulaanbaatar. Can you take a bus only at the bus station where it leaves, or could you take that bus if you're in a little town/city on its way? Thank you very much!! This is a very specific question to the route and the town on this route. Once you get to a town on the way ask what is the best way to get to the next one. For example buses going from UB to Khovd are fully packed and the chances of you getting on this bus from a town close to UB are low. The further you go, there is a better chance you find a seat. Hello, we are 3 students and we would like to visit the Orkhon valley and the Terkhiin Tsagaan lake. What would be the best way to combine both? Is it possible to hitchhike from the Orkhon valley to the lake and back (because we saw there is no bus to the Terkhiin Tsagaan lake)? Is there a way (bus, hitchhinking, jeep,...) of going from Olgii to Murun without passing by Ulaanbaatar and within 1 or 2 days? Thanks!! Olgi to Moron - the cheapest way is by public transport through UB. You can hire a Jeep in Olgi and go to moron by the north route. Terkhiin Tsagaan lake - only by hiring a local jeep. Ask around, any car and driver are ok.
Are the people (those who have a jeep or a car) likely to conduct you where ever you want for some remuneration? If yes, how much is the normal fee an hour? Thanks!! Time is not an issue. Is it easy to hitchhike/atuostop from Khogno Tarna to Kharkhorin? Do you have any idea of the frequency of motorized vehicles? Thanks!! It is off the main routes. Tourists vehicles going to Kharkhorin are packed. To the blogger, thank you for the detailed bus line information. I live in UB but I do not go around much because I do not speak the language, I depend so much on my husband. Though I can read a bit so I can go around abit! We did a trip last year to Khuvsgul and we pass via kharkhorin to the tsagaan lake (stay for some nights) then move up to khuvsgul. we did several stops like in orkhon valley, kharkhorin d temple there, chuluut n other stops. I notice some foreigner from tsagaan lake to moron mountainous road trying to hitchike but (like us we did not stop) SO it would be best if you will hire your vehicle from UB, plan your itinerary and you may go wherever you wish to go. Vehicle rental per day with driver and you cover the fuel. i would go from UB to Lake Khovsgol in winter (february...) is it any problem? bus is one solution there some other solutions? Bus is a good option in winter. Not too many tourists in winter to share the cost of a hired jeep. Hello, I'm planning to go to Mongolia in June. Probably I will visit lake Khovsgol but would like to go there by public transport instead of local tour. Is the bus from UB to Moron still available? Is it possible find local transport to lake Khovsgol in Moron? As I will go to Russia too, any transport go from lake Khovsgol to Russia, like Ulan Ude? Or I must go back to UB to take bus/train? The bus from Ulaanbaatar to Moron leaves every day. When the bus gets to Moron you will see the people going over to the vans and jeeps nearby for a shared ride to further destinations, including Khatgal which is the village on the south part of lake Khovsgol. Going to Russia, the easy way is going back to UB. But you can try and hitch hike or use shared vans from Moron to Erdenet than to Darkhan and to Sukhbaatar. This might take longer, though shorter in Km. Hello, Thanks for the great info. Do you have info on how much it will cost per person to go on the shared van from Moron to Hovsgol? Do you know whether it is easy to find a guesthouse near Khatgal bus station? And where can I buy the ticket from Murun to UB? Thank you. There are several guest houses where the vans from Mororn to Khatgal drop you off. To buy a bus ticket from Moron to UB, simply go to bus station. First, thank you very much for your very, very useful blog.....thanks a lot! On september, I am going to travel by bicycle Mongolia (...well, a small "piece" of mongolia...). The first idea is to take a bus from ulaan baator to erdenesant (packing the bike). In http://www.infomongolia.com/ct/ci/1083 it says the bus departures from Narantuul Market. Is that web site ok? Do you recommend me something different? Do you Know If I have to book in advance (the day before) the ticket. Erdenesant is about two hours drive west of UB. Micro-bus to Erdenesant (in Tuv aimag) leave from Narantuul. Dragon station is for buses going North and far west. You can take the bus to Kharkhorin leaving from Dragon station and get off half way. Is it true that a new highway has opened up between UB and Dalanzadgad? If so, do you know how long it takes to get from UB to Dalanzadgad now? The road between Ulaanbaatar and Dalanzadgad is now completely paved. By bus it takes about 10 hours, by car even less. Thanks for the nice blog! A lot of useful information. I am organizing my trip in Mongolia and I am looking for transfer from village Orkhon (near Bulgan, on the road to UB) to UB. Can I catch the bus from Bulgan (I mean is it real)? Could you also answer how much could be to rent a car with driver (the distance is 343 km)? It is written above 0.5-1$ per km, does this price include expenses for petrol? There is a bus, minivans, and private cars going from Bulgan through Orkhon to UB, every day. If they have space they will stop for you. If you want to be sure to get on the bus hitch a ride to Bulgan. The bus and minivans are much cheaper than renting. Price for renting includes petrol. the camp could be robbed during this time? In the countryside there is no problem. You can leave your tent and go hiking. In any case do not leave valuables like money passport or expensive camera unattended. bus or other transport ??? Thank You for the lots of useful information here. I have a question We would like to travel fom Olgii to Moron in this March. How we can manage that with the public transport? From Olgii take a bus to Ulaanbaatar. From UlaanBaatar take a van or bus to Moron. If you fined more tourists in March in Olgii, you can jointly hire a van to go directly from Olgii to Moron. There is no direct bus from Kharkhorin to Khovd. Best chance would be to take a bus back to UB, than take a bus from UB to Khovd. Arvaikheer is on the main road going from UB to Khovd, so you will be able to get on the bus going through if people get off at Arvaikheer. Time table is flexible. Saying that, always check at the markets to see if there is a van waiting to fill up to your destinations. thanks for many useful comments! During my trip in Mongolia I am planning to catch the bus from Bulgan to UB. I expect that the bus Moron-Bulgan-UB operates every day but I cannot find any information about its time schedule. I hope that there must exist at least some approximate time for arrival in/departure from Bulgan for this bus. Could you give any hint about this? Thanks! Bulgan city is the capital of Bulgan aimag. There is a direct bus that leaves at 8:00am every other day. During summer you can rely on minivans that leave when full almost every day. You can also take a bus to Erdenet, and take the night train to UB. I would not count on buses that go through Bulgan as they tend to be fully packed. The distance between Moron and Bulgan is about 300km, you may try and guess when it will arrive in Bulgan. thanks for the reply, I didn't know about the bus from Bulgan. I am going to be there around September 13th, can I still rely on minivans at this time? Minivans will operate as long as there is demand. In September, maybe not every day, my guess is that on days when there is no bus, a van will fill up. Maybe there's something about navigating this map that I'm not getting, but it seems it only shows how to get out of Ulaanbaatar, not get back to it. In particular, getting from the Gobi region back to the capital in time to make a flight. I am travelling with a group of people and we are renting a car, but I will have to leave before the others, so I need to find some way to get back on my own. From the Gobi, get to Dalanzadgad. The bus to UB leaves from Dalanzadgad. There are also shared vans that leave when full. Give yourself an extra day or two, as public transport in Mongolia is not as reliable as you might expect in western countries. I guess there's no website or any place I could find a schedule? Is it once per day at a regular time (even if approximate)? Or where exactly they leave from? It seems there is a lot of details about the buses leaving the capital, but not much about in other places. Do the buses and vans all leave from the same place? During summer there is a bus in the morning, and a bus in the afternoon every day. In addition there are minivans that leave after the bus leaves, but only when they are full. Transportation leave from about midtown close to the main street, near the shops. Glad I stumbled upon your forum here after a bit of googling! Can you give me some advice on getting to Russia from UB? I have a few queries..
namely I have been in UB over a week enjoying Nadaam and also waiting for the Russian embassy to open to apply for a visa. All has gone smoothly except that the day I pick up my passport on the 5th of August ,will be the day before my Mongolian visa expires on the 6th. I was wanting to catch the bus to Ulan Ude as its quicker and apparently gets me to Russia on the 6th where I need to be! Do you think this is too risky or should it be fine provided I buy the ticket the day before on the 5th? Also do I need my passport to buy the ticket? I have read in a few places that this is the case. Also I am now waiting for 2 weeks and would love to see the Tsaatan community, do you think I can just get on a bus to Muren and book a trip from up there? lots of places only do 14+ day tours that are really expensive so I was hoping I could find a shorter one at better prices at some guesthouses up north. Before UB I already made a trip to the gobi and did a homestay but I wonder if going North while I wait will leave me short on time.. The other thing I am not sure about is that I have read in places you need your passport to get a permit for the trip.. would this be an issue? If you have any answers for me I would be thank full! Some of your questions assume the Russian consulate holds your passport for a few days. Check with the Russian consulate if you have to leave your passport with them. In case you do, make a photocopy of the main page of your passport. You can try and apply for a same day visa. Q: do I need my passport to buy the ticket? A: They want to make sure you have a visa to Russia. A: If you leave on the 6th it is ok. You can also decide to extend your visa. The office is near the airport. Q: get on a bus to Muren and book a trip from up there? A: You can try in Moron or at Khatgal the village on Khovsgol lake. Q: find a shorter one [tour] at better prices at some guesthouses up north. Q: you need your passport to get a permit? A: Yes yo need your passport at all times, and definitely when you apply for the northern permits in Moron. My group's schedule has changed. They will now be in Khustain National Park on the 5th, and that's only about an hour away from Ulaanbaatar. My flight's on the morning of the 6th. Is there any way I could get transported that short distance? Maybe the best way would be to pay our driver to taxi me into town while the rest of the group is at the park. Mongolia is not a country to plan a tight schedule. From Khustain Nuruu park there is no easy transportation to UB. I would not suggest to leave the group without the van, even for a short time. May I suggest you get off the van before you get to Khustain, at a larger town, best would be a town that is a capital of a province. There you will sure find a van, bus, or private car to take you to UB. Better to plan on 2 nights in UB to be on the safe side. After travailing across Mongolia, there is nothing you will miss in Khustain. Thank you Lord i stumbled upon your blog! May i ask if it is possible to take a public transport from Amarbayasgalant Monastery to the Orkhon Valley. We are a group of 3 travelling on October 1, 2016 by public transport if possible. How many hours is the travel time from the Monastery to the Orkhon Valley. Please send me a message also at my email mrdantic@gmail.com. I might contact you also in the future because we really needed help from somebody very reliable traveller of Mongolia. Thank you so much for your biggest help. Im praying for you always! There is No public transport from Amarbayasgalant. You should arrange a driver in advance, best to try from Darkhan, if you go through that town. From Dalanzadgad which is the cheapest of covering YolinAm, Khongor Sanddunes and Bayanzag and return to Kharakorin? I am a solo traveller dependent on Public transport and have lot of time to explore. Any help for this will be appreciated. There is no public transport from Dalanzadgad to all these tourist locations. The only option is to hire a jeep. Thank you. Is there any way I can reach Kharakorin from Dalanzadgad instead of going to UB and then reaching the same? The public transport goes from UB to all Aimag (Province) centers. From there you will find transport to all Sum (neighborhood) centers of that same province. Because Dalanzadgad is in Omnogovi province, and Kharkhorin is in Ovorkhangai province, there is no direct transport between them. You may want to find a few more tourists going the same route and share the costs for a hired jeep. we are a family of four and about to visit Mongolia within a couple of months. Unfortunately we still have some question marks on our list regarding travelling in Mongolia and I do hope you can answer me some questions. I have read there is a bus from Ulaan Bator(Mongolia) to Ulan Ude (Russia). As we are coming from Ulan Ude I was wondering if the bus is also doing the route Ulan Ude- Ulaan Bator daily? Secondly our plan is to travel to Moorun. As I mentioned before we are going to travel with our children (3&5 years old). Do you have any recommendations for us regarding this trip? We were thinking about having one or two overnight stays along the route and take the next bus the other day. Is that possible? Your blog and your personal help is very much appreciated! Q: Is also doing the route Ulan Ude to Ulaan Bator daily? A: not a real option. The bus system in Mongolia takes you from A to B there is no guarantee the next bus will stop or even have vacant seats some where in between A and B. A: Great to travel with children. Mongolia is a large, UU to UB takes 12 hours. from UB to Moron 10 hours. The buses tend to be crowded, not a real joy with small kids for so many hours. I would recommend you hire a van with driver to take you, you can stop on the way as much as you want. I would reduce travel distances, and spend a few days at each location. Can you give me a rough idea how much it would cost to hire a van with driver? Would this also be an option to travel from UU to UB? Driver 30-50USD per day not including fuel. You can hire a driver UU to UB. To compare options: the cost of a hired van, to the cost of public transport for 4. The difference is the cost of "added value of comfort" for you and the kids. You can take a train UU to UB. Another cheaper option, a van UU to the border, than taxi to the train station in Mongolia and a local train to UB. All these options can be checked locally when you get there. This would be for travel in June 2017. And is it possible to buy the bus ticket at the bus station itself on the day of departure? It is better to purchase the ticket the evening before. In most cases the bus gets full the evening before. After the bus leaves the vans fill up, when ever a van is full it leaves. I do not have updated schedule and cost, but it does not change much. When you return you are invited to update the information. We will be traveling by public transport (or private minivans if necessary) coming from Russia to Olgii. The route over Khovd and Altai to UB seems okee. However the route over Ulaangom and Mörön looks more attractive to us. Is this a possible way to reach UB? The northern route is interesting, but remote. there is no public transport. You can hire a van from olgii. Here is a website you can find approximate timetable of bus between cities. It seems you can even book a ticket from this website using VISA or some other credit card, but I did not try. It is for your reference, but unfortunately it has only Mongolian version and no English version. You may have to use Google Translate to translate the website. But after translation, some cities' names will become very strange and you have no idea what is that. The solution is to search the English city name in Google Map and find its Mongolian name, then compare with the Mongolian city name in this website. Can you please tell me the schedules of the bus from Kharkhorin to UB? Does it runs every day? On July (specifically, on the 13th), is there a bus on the afternoon/end of the day? The bus from Kharkhorin to UB leaves twice every day. you will find shared vans that leave to UB but only when they are full. I would like to know the cheaper way to visit eagle hunter from Olgii in Nov, rent minibus or tour? and cost? there is no public transport. You hire a driver with a jeep. Best to share costs with other tourists you might meet in Olgii. There is no fixed price, negotiate with driver. Temperatures are below zero C in November, so not sure you will meet any tourists. But may i know the estimate rate for 1 person cost ? just wondering is under my budget if can't find others to share. One more question, how many days i need travel from Beijing to Olgii by public bus? From Beijing to Olgii about a week. Thanks for the info, seems like not enough time for me travel to Olgii. Any suggestion other interesting places in Mongolia which is near? I was wondering if you can help me. I'm trying to find is there a public transport from UB to Manzushir Monastery? I'm planing to go hikking on Bogd khan mountain in June. From where does the bus leaves in UB and at what times? And when does it goes back? most drivers do not speak English. option1: Take a bus along peace road to Dragon station which is on the west side of UB. at Dragon take a bus to Zuunmod which is the last stop. At Zuunmod take a taxi to the monastery, or walk the last 5km. option2: At dragon or from any other place in UB take a direct taxi to the monastery. It is not a long ride. The way back use same options, the buses stop running at about 8PM. Dan Thank you very much! The information is very useful! Coming to UB in June. Want to do independent trekking in the western Mongolia region. Is it possible to reach other areas (except Khovd and Olgii) in the west by buses? Yes it is possible to get other district centers (sum in Mongolian) in the west. There is no public transport to trekking regions. First you have to determine if the other sum is in Olgii or Khoved Aimag (province). From Olgii or Khoved there are vans going to all villages (sum's) that belong to that same province. Fastest is to arrange a few more tourists and share the cost of a van. Cheapest is to return to UB and take a bus. Do you know how many pp I need for a van? And how much is it cost? I have a question: is it right, that there are a lot of buses between Nalayh and Ulanbaatar? We want to stay in Terelj NP with only onenight between - think take a taxi for the way to the Camp - and now wondering about the best (latest and cheapest) way to travel back. Hi! How are you? Do you know how to get orkhon waterfall from khaKharkho? There is no public transportation to the waterfall. You need to hire a local jeep. dos anyone knows how long is the trip Uulaanbatar-Moron? (in hours), and how much it cost? Would anyone know how to get from Sainshand to Dalanzadgad, by public transport?